Human beings need temporal and spatial references to be able to locate theirselves on the planet and, therefore, in the universe. Thus, we use clocks to measure time and know what time it is, maps to know where we are or where we want to go, and calendars to measure the passage of days, months and years. 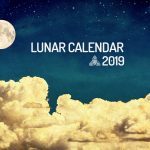 The Lunar Calendar for 2019 is a reference for helping you to discover which periods of the month interest you most and how they could affect you. It happens that every moment of life is related to a certain energy seal, that of the instant when we are born. Being aware of it and knowing which lunar phase we came into the world during will help us to better understand who we are and how we should face life. The energy from the innate boost possessed by people born during the New Moon must be harnessed and channeled. This is why it is a good time to start doing work that attracts you but that you are unclear about how it will turn out. Your initiative will help you discover yourself, through trial and error, without anyone having to help you in anything. The New Moon in 2019 it is also a good time to get to know other places. They don’t have to be on the other side of the world, they just need to be unknown, whether it’s a nearby beach or a state capital that you’ve never been to. It may even be time to change your style or appearance in search of a new image different from what has already bored you. The Waxing Quarter indicates that it is a propitious moment to store energy for future events, both physically and intellectually. Begin to study something that will serve you in the future or finish any projects that you have at work to be able to begin a new project in a little bit. It is time to think and prepare strategies. You will show everything that you prepared in the Waxing Quarter when gathering energy to others, thus making them participate in our ideas. The Full Moon in 2019 will improve the application of the useful strategies you considered earlier. The advice you give to others will be very practical. You will be an effective mediator between people with different points of view. The mediating personality will help you know how to put yourself in the place of others in order to understand how they think and thus facilitate bringing their positions closer together. The Waning Moon it is the right time to clarify ideas and to eliminate everything that does not contribute anything to your life. You will concern yourself with getting away from that person near you who is always lamenting and generating bad vibes. It is also time to end bad habits, such as smoking and having a poor diet or sedentary life. The importance of the Lunar Calendar has always been related to the world of agriculture, the sea and fertility. There will be some effects on nature and other areas depending on the different phases of the Moon. This is why it is very important for the people in the country to take the best time for harvesting into account. The Lunar cycle is also related to the menstrual cycle of women and it is often consulted by pregnant women, as many of them consider that it is beneficial for their future child to come into the world on a Full Moon, thus establishing a special relationship between the amniotic fluid where the baby is located and the movement of the tides. The phases of the Moon are known as the New Moon, Waxing Quarter, Full Moon, and Waning Quarter. A large number of people make sure to follow the Lunar Calendar so they have a reference when making decisions and they know how they will be affected by the energy emanating from Earth’s satellite. The natives of this lunar phase are usually innocent people, without malice, who nevertheless have the necessary energy to satiate their desires, the curiosity to explore different places or discover how the world works through making mistakes, correcting mistakes and moving forward. They like projects where there final decisions will be known by others. The natives of this phase are people who often find themselves between the crossroads of the past and the future. The known and the unknown, the past that weighs them down and the future that shines brightly and gives them hope. They must make decisions in order to progress in life. It is difficult for them, so they always worry about storing enough energy before making the leap into the unknown. Those born under this lunar phase are usually people who are very affected by what others say. That is why they tend to stay away from the rest when they need to make a decision without the influence of anyone else. They are people with a certain strategic capacity and they like to offer ideas to others to achieve a common goal. These natives are afraid of the feeling of emptiness, so they always try to fill their lives, eliminate what is not beneficial to them and look for what is. They spend their energy on renewing themselves positively rather than getting lost in the things that do not contribute to them. They worry about changing habits that prevent them from leading a healthy life, such as being sedentary or having a terrible diet.